I passed Ruth Tibbetts’ house on King Street again today, for the 220th time this year, and regretted again that I had not stopped more often to see her. One of my favorite people at King Street Church, she died on Sunday at age 93 in the house she and her late husband, Jim, had built across the road from her girlhood home, whose barn I pictured here on May 30 and March 28. Two things about Ruth continually surprised and delighted me. One was that no matter how old she got, she maintained a deep and detailed knowledge about current events, nature, history, pop culture—everything, it seemed. She could hold up her end of a conversation on almost any subject. This was all the more remarkable in her latest years, when I doubt that she could see well enough to read newsprint. Another thing that impressed me was her hands. I used to marvel every time I saw them. When they weren’t sheathed in formal white or ivory gloves (Ruth was the last of us who really dressed for church), they looked gnarled and veiny, of course—as I’m sure mine will if I am lucky enough to reach my nineties. And yet they retained an almost preternatural delicacy and grace. When she picked up an object, her long, slender fingers seemed to touch, explore, and evaluate it even more keenly than her eyes did. In part, I suppose this was an accommodation to her advancing blindness; but I believe it also stemmed from a lifetime of examining and appreciating fine objects. Did she acquire it from her years as an antiques collector? Or was it an inborn penchant that fated her to become an antiques collector? As I passed her empty house today, I wondered about this—and about why I had never taken the time to ask her about it. For me, the saddest loss in the death of a friend is the stories that will never be told. I looked through my files today for pictures I had taken of Ruth, and the one above leaped out at me. 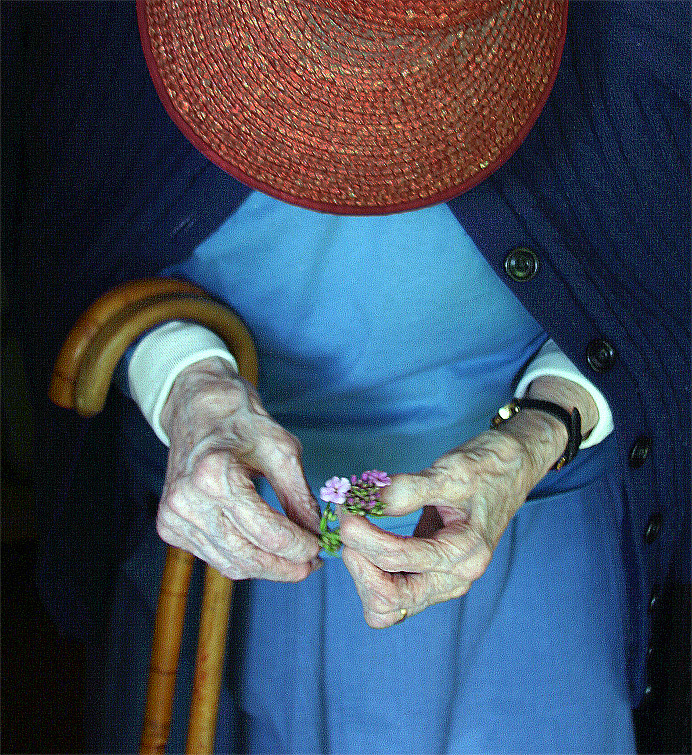 I had taken it on the afternoon of May 26, 2005, when I knocked on Ruth’s door to ask if she could identify the pink wildflowers blooming at the entrance to her driveway. “Are these phlox?” I asked, handing her a sprig. The flowers turned out to be Dame’s Rocket—proof, once again, that Ruth knew something about everything.